Interviewing someone for the post of a general manager is no easy task at all. While looking at the individuals credentials you must ensure that the person is trustworthy, dependable, hardworking and most importantly whether or not he or she is a good leader. There are a number of managerial round interview questions that you can ask potential general manager, but these are the most popular, tried and tested ones. Do not be afraid of asking some interview questions for manager position that are specific to your own requirements because after all, you are entrusting this individual with a great responsibility and you must make sure that he or she is worthy of it as well as capable of handling it. The following mentioned are few managerial questions and sample interview questions for manager position. While you could easily find out these details from the candidates resume, by asking the person this question you are not only attempting to break the ice but you are also getting an idea of how well the candidates speak and whether or not they actually believe in themselves. When you are employing someone to such a high post, you need to make sure that the individual is qualified as well as has the ability to speak and communicate his ideas well. Remember that this person will be representing your company or business at meetings as well as other social gatherings, so would you really like someone who rambles and cannot get his point across to be representing your company and talking to clients and buyers? When you are hiring someone to such a high post, it is always better to hire an individual who has some experience in the field. If the candidate has previous experience then he or she is less likely to have problems coping or dealing with pressure. However, if there is someone who has no experience in being a general manager before, yet has all the credentials, skills and qualifications required to become an excellent general manager then you should not shy away from taking the risk, if you think that he would be able to do complete justice to the position. Being a part of the corporate world often requires you to take risks; sometimes these risks might not pay off but remember often they do. If you have never interviewed someone for the post of a general manager before, then you shouldn’t think that asking a question like this is inappropriate. It is always useful to know whether the individual was fired or has quit and it would possibly benefit you to call his or her previous employers and cross check the details just to make sure that there is no discrepancy. If the candidate quit the previous job to apply for a better one, then an answer like this is acceptable. However, if the individual was fired for something immoral and inappropriate in the work place, then it would be better for you to steer clear of appointing such a person to your firm who could bring some disrepute to it. Asking a question like this is vital so as to get an insight into not only how quick the individual can think and work under pressure but how the candidate plans on using his or her experience, skills and qualifications to face various challenges that might come up along the way, if hired to become the general manager. Based on the answer given you might gauge if the candidate is the sort of person that is afraid of a challenge or if he or she is the rare kind to be motivated by the appearance of a challenge and is willing to face it head long. No general manager’s post comes without stress so you must ensure that you ask this question to know if the person who could potentially be your next general manager has the ability to deal with the stress that comes with the territory. When hiring someone for the post you are looking for an individual who is possibly a perfectionist, who has a fighting spirit and who is persevering, what you aren’t looking for is a person that is very hot tempered and unapproachable. When hiring a general manager for your company or business you want to make sure that you are hiring someone with not just a great deal of social skills but also a person who gets along well with others. You need to ask this question to know if the person has the required outgoing personality to be a good general manger. In addition to meeting new clients and buyers, he or she must also get along well with co-workers, seniors and people at the lower ranks. 7. According to what you think, describe a typical work week for a general manager? Asking this question to a potential general manager is a sure shot way of gauging how apt the candidate is for the job. If he or she is able to touch upon practically all the aspects of the job requirements then you know that he or she knows what the job entails. Based on the candidates words if you get a feeling that the person does not really have a grasp of all the weekly responsibilities of being a general manager then you know that this is not the person you are looking for. 9. What is the first change you would like to make if you hypothetically do become a general manager? In addition to having exceptional managerial and leadership skills, a good general manager has a vision for the company. By asking the potential candidate about the change he or she is going to make first, you get an insight into the kind of dream the person has for the company. If you own a company you obviously want your company to become bigger and more successful in the years to come, so keeping this goal of yours in mind you should hire a general manager who is willing to dream big and is always willing to put the needs of the company before his own. You should ensure that you ask the individual if he or she is willing to be called into work whenever necessary irrespective of it being early hours of the day or even late hours of the night. Having a high-end job like this could imply improvement on the financial front but on the personal or family front the person will have to give up on a great deal. Make sure you hire someone who is willing to make a serious commitment to the company in terms of the time and effort which he or she must be required to invest. The decision to hire someone as general manager to your company or restaurant is no small one. So you should not be afraid of taking your own time, because after all the success of your business depends on a large extent on how capable your general manager is and to what extent he or she represents the policies and high standards of the business. So asking this question will give you insight into whether or not he or she accepts and is willing to adhere to everything the company stands for. This is a mandatory question that is asked in practically all interviews to inquire if the candidate has to ask you any questions, once the process of you interviewing him or her is complete. Applying for any new job can be both new and confusing, so do take the time out to answer any questions that the candidate might be having in relation to salary, duties, responsibilities or any other aspect of the job. 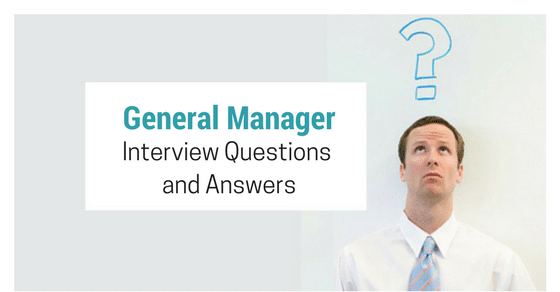 These are some of the general manager interview questions that you not only should but must ask any potential general manager during his or her interview. Keep in mind, your interview questions for managers should be direct so that you get a clear sense of the work ethic as well as the skills and qualifications of the person who is a potential candidate for this high-end post.